The Heilbronn University is known for congresses and conferences in the field of elevators for many years. Now, a research project is started which aims various aspects of the automation of elevators with CANopen. Examples are compliance tests "in the loop" and the possibilities of telemetry and remote diagnostics. Suggestions and discussions on the project currently come from Mr. Hellmich, Böhnke + Partner, Bergisch Gladbach (now c/o elfin.de). In order to obtain a realistic test environment, a group of four students from the master's degree courses in Mechanical Engineering and Mechatronics at the Heilbronn University under the direction of Prof. Dr.-Ing. 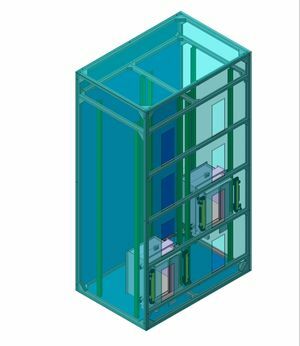 Ansgar Meroth started a project in which an elevator system model on a scale of 1:10 is built and controlled via original CANopen components. All CANopen components are simultaneously simulated by a corresponding function model in Vector CANoe and MathWorks Matlab/Simulink, allowing to replace components by real time simulated functions. The resulting model system shall demonstrate the CANopen standards and provide an opportunity to review new components for conformity. It differs fundamentally from a previous model, designed in the MG lift, by a higher mechanical detail. With its open architecture, a combination of both demonstrators is possible. The aim of the model is to construct and build an elevator system on a scale of 1:10. 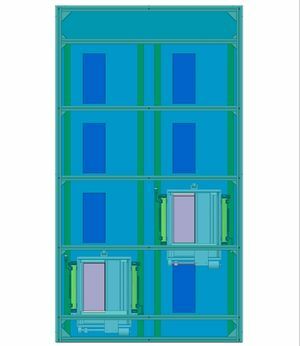 The model will show two shafts, each with three floors and one cabin per shaft. 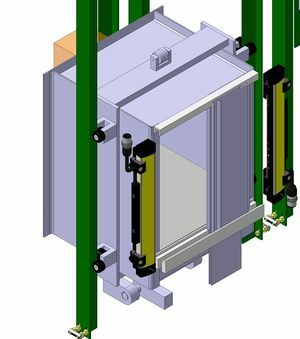 The functionality of the model will correspond as far as possible to the actual functionality of real elevators. However, due to the miniaturization and the better handling, all control panels and control units are not directly installed inside the model, but separated in a control cabinet. Because the usage on fairs and exhibitions is possible and welcome, as many components as possible will be provided with windows or will be made of transparent material to allow a better insight. Furthermore, the model will be secured, so that visitors can not touch moving parts or electrical components. To enable the usage on exhibitions, the model will be transportable. This leads to additional demands on the model. 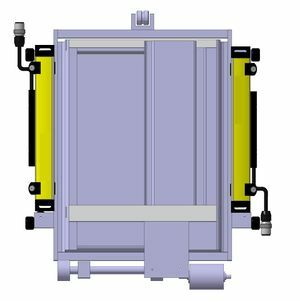 The model with dimensions of 1200 mm x 600 mm x 400 mm (HxWxD) is transportable in a car. Furthermore, splitting of the model and securing the movable parts will be guaranteed. A video of the model you can find at the end of this article. All control units used in the demonstrator should be, as far as possible, original equipment of real CANopen lifts. The project additionally aims a simulation of the model with all control units with the aid of Vector CANoe and MathWorks Matlab/Simulink. By monitoring the CAN signals of the demonstrator, both programs shall reflect the status of the system. Furthermore, additional control messages should be able to send from these programs to enable a remote control (e.g. call a lift). Thus, additional components or a third shaft may be simulated. In a follow-up project, remote diagnosis is planned. Currently, the design of the system is made with CATIA V5 R19 by Dassault Systèmes. Simultaneously, the Matlab/Simulink and CANoe models are built. Because some components of the elevator model are very expensive, especially the electronic components, you are kindly invited to contribute with your products. We will attach your logo at a prominent place on the model to indicate you as a sponsor. …to be continued with your help…. In this video you can see the reference lift at work. This page was last edited on 18 August 2014, at 14:41.